August 28 was chosen by Thomas & Ruth Roy of Wellcat.com to be Race Your Mouse (Around the Icons) Day. They created the day just for fun as a way to entertain yourself while you are waiting for a page to come up on your computer. This wacky holiday is aimed at your 'computer mouse', but there are a few other fun 'mouse' things we shall review here. Most people say “Eek!” if they see a 'mouse'. But the resident Mouse-in-the-House of Review This! is a special and much loved lady known as SylvesterMOUSE. Sylvestermouse created the blog you are enjoying reading ~ Review This! Our MOUSE is a multi-talented writer who shares stories, recipes, craft tutorials, and fun facts about fascinating animals. She's a photographer and a crafter and a wonderful friend to many. Check out her About Me page for a list of her fantastic and fascinating sites online. My favorite is the HOUSE OF SYLVESTERMOUSE which includes links and stories about terrific items found in her Zazzle and eBay stores. The charming mouse figurine pictured above is an example of what she carries in the mouse corner of her eBay Mouse-House! If you are curious how Sylvestermouse got her name, read her delightful story here. Yes, it involves a real-life mouse! Your author, Wednesday Elf, is a crochet crafter and sees most things in the form of plush animals. Therefore, she had to make a plush toy 'mouse'. Her name is Mindy (the Mouse), an Amigurumi-style toy mouse who measures 6 x 5 inches -- a nice roly-poly roundness that is just the right size for little hands to hold. Babies love to grasp the ears and feet and use them for teething! 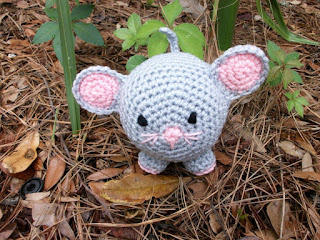 Plush mouse can usually be found in Elf's Etsy Shop Coastal Crochet Crafts. At the moment, the latest Mindy Mouse went to be a playmate for a little boy in New York, but check back soon for another crochet mouse (or request one from my Etsy Shop). For a useful and unusual hot pad for your table, how about a hot pad in the shape of a Mouse. It's sure to invite interesting dinner table conversation. 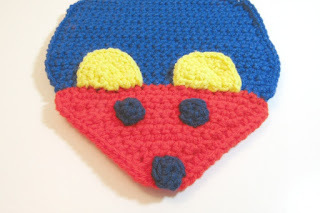 The mouse hot pad is hand-crocheted in royal blue and red with yellow ears. It measures 10 inches long and 8 inches wide with a 6 inch tail. The hot pad is made double-thick of washable acrylic yarn. The body is blue, the face is red and the ears are yellow. Crocheted dark blue eyes and nose in yarn complete the features. 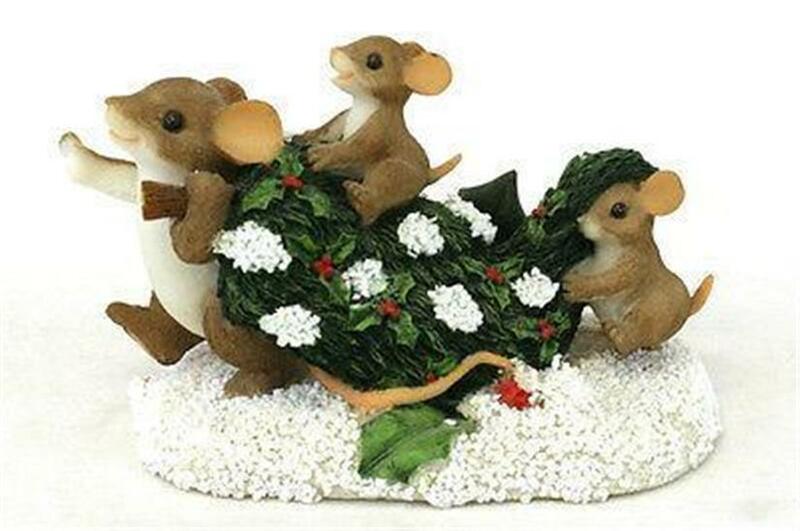 A whimsical, happy-looking mouse for hot dishes on your table will be a novelty conversation piece. 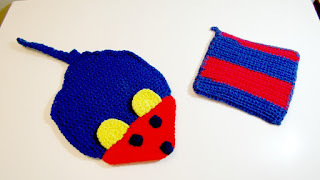 The mouse hot pad comes with a matching blue and red potholder for your cooking chores. Crocheted of ombre yarn, the color pattern changes throughout. The back and the front have different designs. Potholder measures 6 x 7 inches. How Did the Computer Mouse Get It's Name? Douglas Engelbart created this special tool in 1968 to help people navigate graphics-filled computer screens. The first 'mouse' was a small wooden block on wheels with a long cable sticking out of the back, making it look like a tail. One of Mr. Engelbart's researchers called the tool a mouse ~ and the name stuck! There are scientific and technical explanations for how this all works, but us ordinary computer-users are just happy that we can roam around our computer screens with a simple motion of the hand. We'll leave understanding the technology to the experts! Today's computer mouse is so sophisticated that you don't even need a 'cord' (tail) anymore as the cordless mouse does the work for us through Wi-Fi. They come in a multitude of shapes, styles and colors for your enjoyment while you work and play online. Check out this review of a Wireless Computer Mouse here on Review This! So, put August 28 on your calendar to celebrate the many mice in our Mouseland Review and acknowledge Race Your Mouse Day! What a fun review of Race Your Mouse Day and all things mousey! Seeing mouse gifts and having a (Sylvester)mouse for a friend, makes it easy to go from 'Eek, it's a mouse, to 'awww'. :) Thanks for visiting, Beverly. What a fabulous article! You were so very sweet to write this article and include me Elf. You tempt me once again with a Mouse hot pad. I truly love mine! I think of you every time I pull her out to use. Her sister made quite a hit with my sister-in-law this past Christmas. I had to force myself to give her away, even though she was originally purchased for my sil. I still wanted to keep her. I can tell you for sure, not only are the mouse hot pads adorable, they are thick enough to really protect any table or counter, including my wood dining room table. Since I believe both my brother (the giver of my mouse Sylvester) and Sylvester are in heaven, I figure he is up there tweaking Sylvester's whiskers right now. Mouse, I'm sure that your brother and your field mouse, Sylvester are both very proud of you and your accomplishments and enjoy keeping track of you. Knowing you liked my mouse hot pad, I simply had to make another for others to enjoy. Love the mouse gifts, love Miss Mouse! What a delightful article! You are so clever Elf and of course we all love Mouse. What a great way to bring together a posting for Race Your Mouse Day! Thanks, Mary Beth. It was really fun putting this together. And, of course, with Sylvestermouse in so many places around the World Wide Web, it was easy to find things that show off her good work. So excited to learn about Race Your Mouse Day and to read this sweet post! Miss Sylvestermouse is a very special person and very honor-worthy. Love the crochet mouse items, Elf. They're totally adorable, as is the decorative computer mouse - which brings us full circle. On Race Your Mouse Day, may the best mouse win! Thanks for your sweet remarks, Susan. Having a 'Mouse Day' makes it easy to feature our Sylvestermouse.... and it just so happened that I had a couple handmade 'Mice' to show off too. A win-win situation, with Cynthia being the BEST mouse! What a great article! Love your Mindy mouse, too!! I had never heard of Race Your Mouse Day so once again, I learned something new from your article. I always learn something new when I read one of your blogs Wednesday Elf. I always wondered how the computer mouse got its name. I found that interesting, too, Linda ~ learning how the computer mouse got its name! :) Thanks for the visit. I always loved her story of her pet mouse, Sylvester. Thanks for visiting, Barbara. Love this and all the related stories to go with the "mouse" theme. Miss Mouse is a favorite of mine personally. I love the other mice in this write up too! 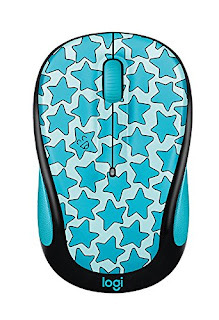 Since the coming of computer mice, I no longer think "EEK" when someone mentions them either. Thanks for a smile and a chuckle today.